It is one of the iconic images of the 20th century: the dark gray mushroom cloud billowing upward from the top of Mount St. Helens, a great and terrifying stain on the sky. Hikers 50 miles away on Mount Rainier watched the blast cloud climb up one side of ridges and down the other, like a smoldering wave engulfing the land. Trees surrounding the volcano lay strewn about in endless fields of matchsticks. From the photographs, it seemed as though the eruption, on May 18, 1980, had laid waste to the entire Pacific Northwest. It was one of the roughly 20 largest volcanic eruptions globally in the past 500 years, and the single most powerful natural disaster in American history. Remarkably, only 57 people died. By comparison, a much smaller event at the Nevado del Ruiz volcano in Colombia in 1985 triggered a mudflow that killed some 22,000. The tiny butcher’s bill at Mount St. Helens was blind luck, a product both of the site’s remoteness in southwestern Washington state and of the eruption’s timing on a Sunday morning. Some 5,000 miles of logging roads surrounded the volcano. Had it blown just 24 hours later, hundreds of loggers working in the region’s old-growth forests would have perished. The volcano rumbled to life two months before the main eruption, triggering hundreds of small earthquakes and a steady plume of steam and ash from the crater. Volcanologists and tourists flocked to the mountain, eager to study the event or witness history. Yet they came much too close—especially small groups of hikers and campers who spent Saturday night in the volcano’s pristine forests. Mr. Olson harbors a fine rage at the failure by state government and the U.S. Forest Service to cordon off an effective blast zone. This topic forms the heart of the book. Gov. Dixy Lee Ray began deflecting blame for the deaths several days after the eruption, lamenting those who “chose to remain” near the mountain despite warnings. President Carter echoed this sentiment when visiting the site. Mr. Olson calls this a “pass-the-buck fabrication” and devotes many pages to debunking it. His account is persuasive. Far from warning individuals about the volcano’s dangers, Gov. Ray neglected to act on an urgent proposal to extend the blast zone and erect roadblocks. She actively cheered on the most outspoken holdout, an 83-year-old curmudgeon named Harry Truman who attracted publicity by refusing to leave his cabin on the shore of Spirit Lake, about 5 miles north of the crater. Gov. Ray even sent Truman a letter egging him on: “Your independence and straightforwardness is a fine example for all of us, particularly for senior citizens.” Mr. Olson portrays Truman, who died in the eruption, less as a spitfire than as a mournful figure, trapped by his own defiant rhetoric. The blast zone remained inadequate because of officials’ reluctance to extend it onto private land. Weyerhaeuser Co., a 100-year-old logging concern and one of the region’s largest employers, owned much of the forest on the western and northwestern flanks of the volcano. Officials set up a red zone (no access) and a blue zone (restricted access) around the mountain, but in deference to Weyerhaeuser, they established no blue zone at all to the west and northwest. The company refused to halt its operations in the weeks before the volcano’s eruption, despite increasingly frantic protests by the loggers. Ironically, one of the handful of company employees to perish on May 18 was a foreman who had declined to report his crew’s concerns to management. He and his wife had left early Sunday morning to check on their logging equipment. Some of the men and women situated near the volcano when it erupted perished instantly. These include geologist Dave Johnston, who had stayed overnight in a camper on the Coldwater II Ridge due north of the volcano. Others, like horsemen Clyde Croft and Al Handy, nearly survived, succumbing to burns and ash asphyxiation as they tried to hike out of the blast area. The pages of “Eruption” are filled with sharp reporting and offer a noble tribute to the 57 people who lost their lives on May 18. The most remarkable section of the book concerns the handful of survivors from the immediate blast area. In Mr. Olson’s telling, their stories read like urgent fiction. One couple sheltered in the hollow left by an uprooted tree, covering their heads in cloth to avoid breathing in the noxious air. A man who suffered a shattered hip crawled his way out far enough to be spotted by a rescue helicopter. A desperate family with infant in arms rushed into a hunter’s shack, hiding under tarps as the windows darkened and debris pounded the roof. These vignettes lend a human face to an event that has become associated largely with geology. 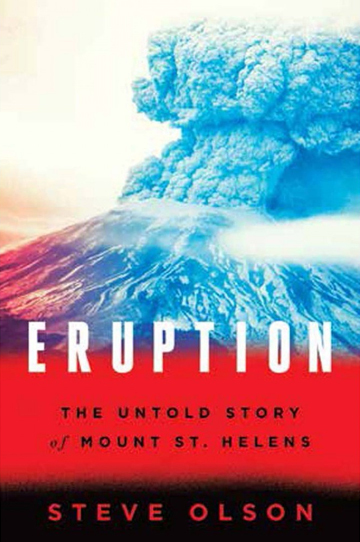 “Eruption” ends with the fraught but ultimately successful push to create a national monument around Mount St. Helens. This initiative, led by conservationists and ultimately signed into law by Ronald Reagan, preserved 110,000 acres near the volcano for use by tourists, hikers and scientists eager to study the area’s recovery from such a rare disaster. Mr. Olson calls this “a farsighted act for an often shortsighted species.” Scientists have found the land to be far more resilient than predicted, as crushed logs return to earth and flora and fauna profit from the riches. Today the region enjoys even more biological diversity than it did before 1980. The technical term used by ecologists to describe this process, Mr. Olson notes, is a hopeful one: renewal.